Pune, Oct 25 (IANS) New Zealand won the toss and elected to bat against India in the second of three-match One-Day International (ODI) series at the Maharashtra Cricket Association Stadium here on Wednesday. New Zealand, who lead the series 1-0 have retained the same playing XI. India, have brought in spinner Axar Patel to replace Kuldeep Yadav. 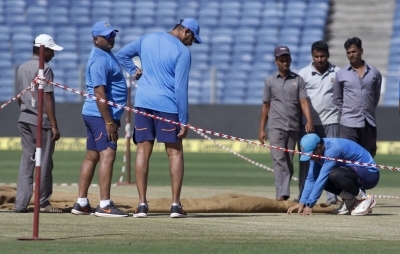 India: Rohit Sharma, Shikhar Dhawan, Virat Kohli (captain), Dinesh Karthik, Kedar Jadhav, Mahendra Singh Dhoni (wicket-keeper), Hardik Pandya, Axar Patel, Bhuvneshwar Kumar, Jasprit Bumrah, Yuzvendra Chahal. New Zealand: Martin Guptill, Colin Munro, Kane Williamson (captain), Ross Taylor, Tom Latham (wicket-keeper), Henry Nicholls, Colin de Grandhomme, Mitchell Santner, Adam Milne, Tim Southee, Trent Boult.